Every year in late December, in the spirit of special year-end training at dojos in Japan, Silicon Valley Shotokan Karate organizes a year-end punch-and-kick-a-thon. Dojo members collect pledges for charity donations and then do thousands of punches and kicks to earn the donations. It’s a great chance to help people and get in some intense physical training during the holiday season. The event began 12 years ago as a kick-a-thon (before that, we were doing punches, starting in 1998), with the goal to do 2006 repetitions of front-kick for the coming year 2006. In 2013 we added punches for the adults to raise the bar, doing 2014 reverse punches — after completing 2014 kicks. 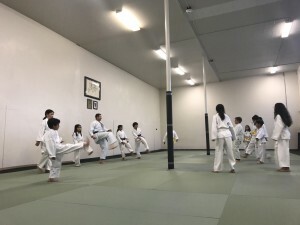 Physically it’s a lot, even for well conditioned athletes, so many dojo members begin training months in advance to build the strength and stamina they’ll need. Everyone agrees they feel great when they finish. The kick-a-thon has also grown beyond the SVSK dojo, with other clubs around the world taking up the challenge, too. Selected charities have included the Leukemia and Lymphoma Society, St. Jude Children’s Research Hospital, Children’s Hope International, Child Advocates of Silicon Valley, various food banks and many others. Last year, we donated to Direct Relief International for the second time. They are a great charity and are currently helping in the aftermath of recent California fires and are expected to be doing a lot more over the coming months. Check here for updates and announcements to see when the kick-a-thon is scheduled. We look forward to seeing you there!